Hill should walk it in, but it has a vexed history of late, has it not! 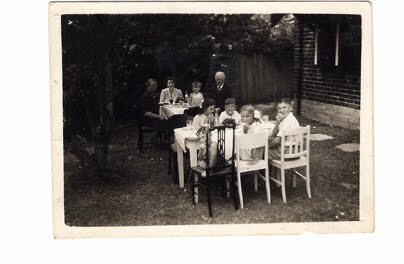 Archive photo of my family, with grandparents at one table and my siblings at the table in the foreground. If you look closely, that is little Andrew standing up at the far table. Final adjustments just done, so some copies will be in the mail tomorrow. After Easter I'll be hawking it around for $15 a copy. It is slightly different than the 1992 FACP version - I have flicked some poems and replaced them with more recently written ones which are thematically appropriate. “Life has got a habit of not standing hitched. You got to ride it like you find it. You got to change with it. 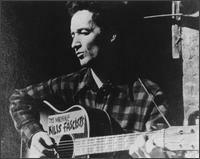 If a day goes by that don't change some of your old notions for new ones, that is just about like trying to milk a dead cow.” Woody Guthrie, American song writer and folksinger. Steven Waling at Brandoshot at http://stevenwaling.blogspot.com/ is quietioning why he ended up linked on Ron Silliman's blog with a wonderful piece entitled Becoming Post-Avant. Take a look at it - it is entertaining and, to my mind, relevant. 4. It was a pressure in my head that made me finally admit that I was whatever kind of poet it is I think I've become. I had a failing poem that annoyed me so much, as a last resort, I cut it up. Lo! A light came down from heaven illuminating the path I must follow... or something... Rather, I discovered that I didn't have to do the whole thing straight, that going the crooked route was just as interesting. 5. I want to be as clear as possible. But life isn't clear, it comes at you from all kinds of directions at all kinds of speed. And I have to confess that I like, and think that poetry should reflect my experience, rather than try to impose an artificial order on it. 6. 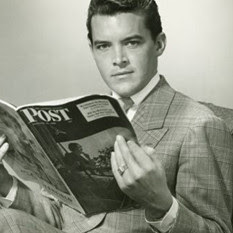 How important is the reader? Important enough not to be mollycoddled. We all have our own perception of life, our own way of engaging with it or experiencing it. We depend on our senses to help us form an impression, understand our surroundings and act accordingly. But no two people experience the same thing. We are all individual. We all have our own unique way of perceiving the world. How do you perceive yours? The Australian Poetry Centre is running a poetry competition, seeking poems which show us life from a totally unique perspective, from your own sensory experience, allowing others an insight into your distinctive view of the world - how you feel, observe and encounter it. The top five poems selected will be (with the poets permission) recorded, performed and released on our poetry podcast (in partnership radio station 3RRR), Nothing Rhymes with RRR, and be published on the Australian Poetry Centre’s website. The poet who wins first prize will also receive one free Australian Poetry Centre Membership and the opportunity to read his/her poem at our public event on the night of May 7th, Dreaming in Auslan, at the Wheeler Centre (176 Little Lonsdale St, Melbourne), 7:30pm, where all winners will be announced. If you cannot attend the evening, we can provide a speaker or established poet to read or present your work for you.
. What is government but ourselves? It’s the institutionalization of our collective being in order to accomplish some things we agree need to be done. Stop signs for example. Police for another. Schools for a third. Government may not work well, it may be bloated, sclerotic, bureaucratic. But it is ourselves. We have nobody else to blame. - Just part of a rich posting by Ron Silliman on his blog today. This is a post worth reading, a personal statement about the politics of USAmerica today. Go to http://ronsilliman.blogspot.com/ for lots lots more. from light to dark. We’re lucky. furry footage and hysterical audio. Climate Change and Nature’s Fury. today. That’s the way it is. and key in their findings. In a hospital's Intensive Care Unit, patients always died in the same bed, on Sunday morning, at about 11:00 am , regardless of their medical condition. 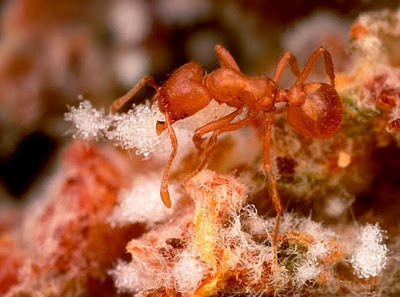 This puzzled the doctors and some even thought it had something to do with the super natural. No one could solve the mystery as to why the deaths occurred around 11:00 AM Sunday, so a worldwide team of experts was assembled to investigate the cause of the incidents. The next Sunday morning, a few minutes before 11:00 AM all of the doctors and nurses nervously waited outside the ward to see for themselves what the terrible phenomenon was all about. Some were holding wooden crosses, prayer books, and other holy objects to ward off the evil spirits.. Just when the clock struck 11:00 , Pookie Johnson , the part-time Sunday sweeper, entered the ward and unplugged the life support system so he could use the vacuum cleaner. Two animal rights defenders were protesting the cruelty of sending pigs to a slaughterhouse in Bonn , Germany .. Suddenly, all two thousand pigs broke loose and escaped through a broken fence, stampeding madly.. The two helpless protesters were trampled to death. 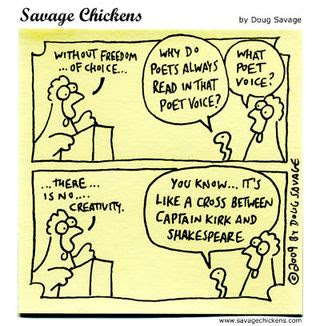 If a poem is enjoyable - and that one is awful - does it matter who wrote it? Should we bother putting our names to poems or just send them out into the world from the fabled makar, Anon? I know my ego wouldn't let me do that - and yet there are times when I wish I had! 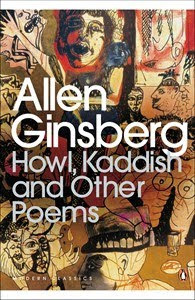 Dreadful poems which my name attached, sit in someone's bookshelf or bottom drawer - it is a pain. But that pain is relieved when a reader volunteers praise for a poem - or even a line in a poem! Ah, ego - it is my ego that is starving in a garret while I overeat in the kitchen. For he is of the Lord's poor and so indeed is he called by benevolence perpetually -- Poor Jeoffry! poor Jeoffry! the rat has bit thy throat. For he killed the Icneumon-rat very pernicious by land. 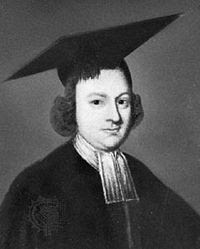 Jubilate Agno (Latin, "Rejoice in the Lamb") is a religious poem by Christopher Smart, and was written between 1759 and 1763, during Smart's confinement for insanity in St. Luke's Hospital, Bethnal Green, London. Jimmy Pike, Desert psuchedelis, installation at Gallery Artisan. Jimmy Pike's designs are vivid, dynamic and groundbreaking in their use of non-traditional colours. In collaboration with the company Desert Designs, they exploded onto an international stage via high-fashion garments, textiles and furnishings. Desert Psychedelic, curated by Kirsten Fitzpatrick for artisan in partnership with Desert Designs, features Pike's original prints, textile lengths and the garments produced from his fabric designs. Australian Catholic University, Brisbane. The East Kimberley Painting Revisited exhibition showcases the work of Rover Thomas, Freddie Timms, Rusty Peters and Jack Britten (an Art Month event). Rover Thomas was the doyen of the painting movement that emerged in the eastern Kimberley region around 1980, focused on the Aboriginal community of Warmun adjacent to the township of Turkey Creek. 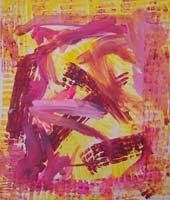 Jack Britten is renowned for his paintings of Purnululu (the Bungle Bungles) and his use of rich ochres often mixed with dark red bloodwood resin. Freddie Timms' large canvases, such as Frog Hollow trace the features of his land; its black and red soils, water holes, creeks and hills. Rusty Peters' canvases are visually close to those of Rover Thomas and the Turkey Creek artists but he has also found inspiration outside the aboriginal community. Take a look at this marketing statement from Penguin - it's about the cleverest copywriting I've seen since I stopped writing it! Apparently it was originally 'in house' but now they have used it for marketing purposes. Brilliant. My Canadian friend Doug Barbour is poet, lecturer and editor - a moving force in Canadian poetry. So it is a great pleasure to see him celebrated in the highly prestigious pages of JACKET Magazine. 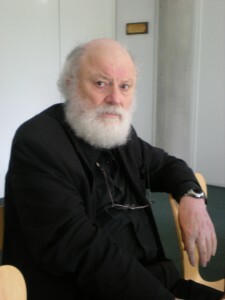 Image: You gave a lecture in Rotterdam about ten years ago called "A Defense of Poetry," in which you talked about poems and "poemes." Has that been published anywhere? LM: It's in a book of essays called A Working Forest. My idea was that in any human creation there's going to be a participation of the dream mind as well as the logical, daylight waking mind. And there's probably also going to be some kind of participation of the body. They're all going to be enacted in some way. And the more vigorously and simultaneously they're enacted, the closer the approach to the condition of poetry. Everybody's got a few magical things in their lives. They can talk about them as if they were rational and logical, but in fact their heart is poetry. 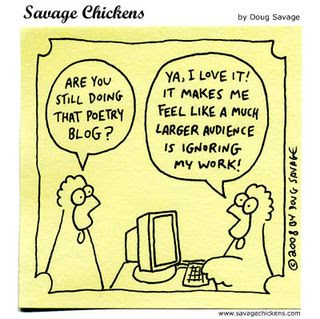 What's the poem of your life? Well, one of them is your marriage, quite often. One of them is your favorite hobby, or hobbies. And a few other things. Your political affiliation and dreams in that direction. There usually won't be too many. There'll be a few small ones, and a couple big ones. That's the standard equipment of a human soul. I call them poemes. It's a word derived from the same sort of language as "morpheme" and "grapheme" and "phoneme" and so on. Image: What are your dreams in the direction of politics? LM: Haven't got any, that's the trouble. I don't believe in politics. I don't think it ever does much good. Even at the best of times, you don't get much out of politicians. Ideology and Hollywood have superseded them, reduced them to obedience. The Whitmore Press - publisher of chapbooks, recently established by writers, Barry Hill, Paul Kane (US) and Brendan Ryan - is now seeking emerging writers to publish. Entry is $10 and the winner will receive a chapbook (32 pages) contract. Right after John's death, his family and friends helped Brandl & Schlesinger publish one of the handsomest little volumes of Australian poetry ever, Damaged Glamour. It has everything going for it in book design - great cover, good paper - a kind of cream stock - and enough 'white space' to let the poems breath on the page. It is short at 60 printed pages, but as with John Forbes other collections, it is dripping with wit and erudition stated in a mix of popular culture diction and elevated thought. I am amazed that it is twelve years since his death. If you don't know John Forbes poetry, order a book today - you will read it for years to come. 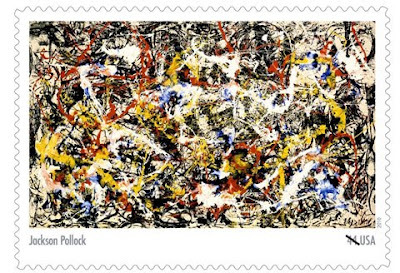 USA Stamps celebrate Abstract Expressionism - who'd have ever thunk it!! Recently I showed the great new Australian stamps celebrating our contemporary writers - I showed Peter Carey and Tim Winton, two of my favourites. Now here are a couple of my favourite USA artists, Jackson Pollock and Adolph Gottlieb. Another favourite in the series, but not illustrated, is Mark Rothko. Well, maybe it took a while but at least they're here, ready to be enjoyed by every person who still receives snail mail. The history of the Australian cricket team is rich and diverse. 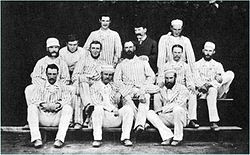 Together with the English cricket team, it participated in the first Test match in 1877. A highlight of Australia's early history was the 1882 Test match against England at The Oval. In this match Fred Spofforth took 7/44 in the game's fourth innings to save the match by preventing England from making their 85-run target. After this match The Sporting Times, a major newspaper in London at the time, printed a mock obituary in which the death of English cricket was proclaimed and the announcement made that "the body was cremated and the ashes taken to Australia." This was the start of the famous Ashes series in which every two years Australia and England play a number of Test matches to decide the holder of the Ashes. To this day, the contest is one of the fiercest rivalries in sport. The Ian Reed Foundation is offering two residencies for Australian writers who want to explore the creative possibilities and challenges of writing a performance work for radio. We're looking for fresh ideas and terrific writing—and a convincing demonstration that your idea will work in the medium of sound. We're looking for ideas that can be developed as radio drama, but you don't have to be a playwright. We welcome proposals from poets, essayists, journalists, novelists, dramatists, songwriters or creators in any other form who have an idea with potential to exploit the radio medium." Black Inc are now accepting poems for The Best Australian Poetry 2010. 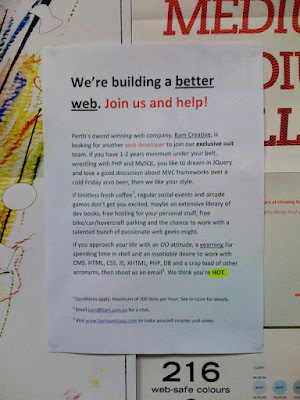 Level 5, 289 Flinders Lane, Melbourne, Victoria 3000. The poems are on display inside around 100 buses on Canberra's busiest routes. Bus journeys around Canberra will be little more literary than usual over the next few months. The ACT Government hopes to instil in commuters an appreciation for poetry, decorating inside ACTION buses with musings on subjects as diverse as disapproval, possums, and the pluses of buses themselves. It is the fourth year of Poetry in ACTION in the ACT, with six poems by four local poets chosen to grace the walls of around 100 buses on Canberra's busiest routes. Some poems reference Canberra, extolling the National Library and Commonwealth Bridge, while others deal with more universal themes like aging and separation. 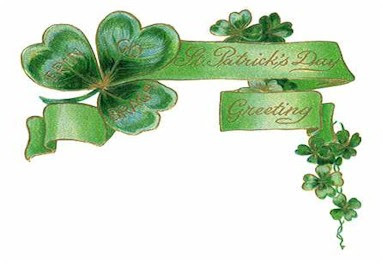 The idea originated in London nearly 25 years ago with Poems on the Underground, and has since spread to Dublin, New York, Paris, Stuttgart, Barcelona, Athens, Moscow, St Petersburg and Shanghai, as well as Adelaide, Melbourne and Sydney. ACT Chief Minister Jon Stanhope says the project aims to increase people's exposure to poetry, as well as provide a forum for local poets. "I think poetry as an art-form is not perhaps as appreciated as it once was," he said. But he says the bus-riding community has responded well to the poems. "I've always been surprised in terms of my role as Minister of the Arts, [at] the number of poets in the ACT and the very high level of interest and support for poetry in the ACT," he said. 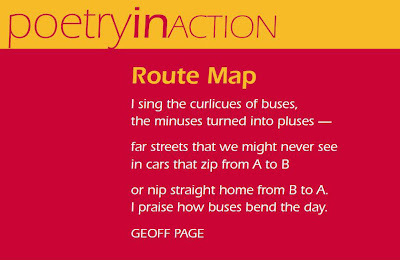 "At a community level that's reflected through the very strong feedback we get from patrons of ACTION buses to the poems." Long-listed poets from the ACT Poetry Prize's David Campbell Award were commissioned to write short poems specifically for display in the Territory's buses. The final six chosen were written by Danijela Kambaskovic-Sawers, Moya Pacey, Geoff Page and Maggie Shapley. It's all about books and reading. A major survey of how the nation engages with the arts has revealed 85 per cent of Australians are avid readers of poetry and literature but when it comes to actually creating art, visual arts has the biggest number of participants. In Pomo Oz, Niall Lucy pits his humour and intellect against the conservative power brokers, championing the notion that free thought, not free trade, is the basis of democracy. Lucy is one of Australia’s leading thinkers on Derrida & postmodernism, so if you’re sick of hearing people bang on about the evils of the postmodern (when they obviously have no idea what they're going on about) come along! Or if you think postmodernism is less a philosophy than an excuse for a bit of moral relativism? Come along too. Let’s see how much slippage we can squeeze between the signifier & the signified. 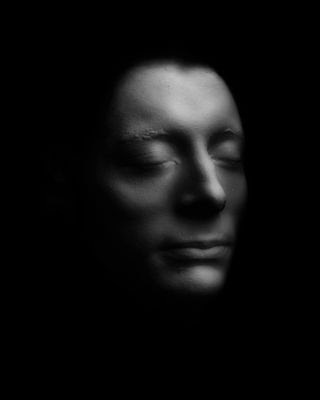 ... here is a remarkable photograph of Keats' life mask by artist Benjamin Haydon. 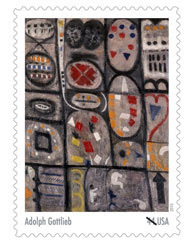 Australia Post have released a series of standard priced stamps (55 cents) depicting contemporary Australian authors. I present you with two of my favourites, Peter Carey and Tim Winton. Next time you rip open an envelope, pause a moment to see who is on the stamp. 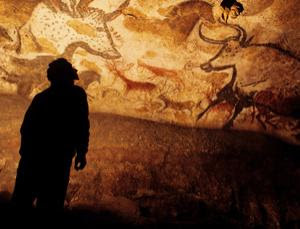 "THE first intrepid explorers to brave the 7-metre crawl through a perilously narrow tunnel leading to the Chauvet caves in southern France were rewarded with magnificent artwork to rival any modern composition. Stretching a full 3 metres in height, the paintings depict a troupe of majestic horses in deep colours, above a pair of boisterous rhinos in the midst of a fight. To the left, they found the beautiful rendering of a herd of prehistoric cows. "The horse heads just seem to leap out of the wall towards you," says Jean Clottes, former director of scientific research at the caves and one of the few people to see the paintings with his own eyes." If you are 12 to 25 years old, this may grab your fancy. Make your own Zine for FREE.